Kaur’s first film Divided We Fall (2008) with director Sharat Raju toured in 200 U.S. cities, won a dozen international awards, and became known as the go-to documentary on post-9/11 hate crimes. The Divided We Fall Campaign inspired dialogues on 100+ campuses and communities in the 2008 and 2016 election seasons. 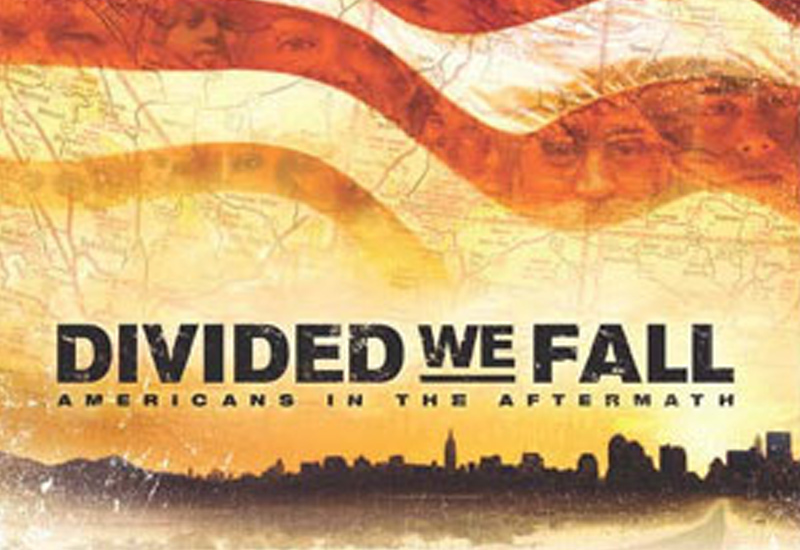 Divided We Fall is a critically acclaimed documentary film on hate crimes in the aftermath of 9/11. Told through the stories of Sikh Americans, the film offers vital historical context to the current crisis of hate and nationalism in the U.S. — and how we can change it through the ethic of Revolutionary Love. 2008 | 90 min | Color | U.S.A.
A college student sets out across America in the aftermath of 9/11, camera in hand, to document hate violence against Sikh and Muslim American communities. From the still-shocked streets of Ground Zero to the desert towns of the American west, her journey confronts the forces unleashed in a time of national crisis–racism and religion, fear and forgiveness–until she finds the heart of America: halfway around the world. Winner of more than a dozen international awards, Divided We Fall “is an illuminating meditation upon what it has meant to be ‘one of us’ since September 11″ (Harold Koh, Dean of Yale Law School). On tour, the film has inspired dialogues in 300+ universities, colleges, festivals, houses of worship, corporations, and schools around the world. It is celebrated as “a starting point for the new dialogue on race and religion that is essential to America’s future” (Diana L. Eck, Professor of Comparative Religion and Indian Studies at Harvard University and director of The Pluralism Project). Divided We Fall: Americans in the Aftermath is the first feature-length independent documentary film about hate crimes since September 11, 2001. It offers vital context to today’s resurgence of hate and violence and inspires ways to respond with #RevolutionaryLove. "A tour de force. Shocking and disturbing yet deeply moving and ultimately inspiring. Not to be missed." "A film that is bringing vicious intolerance aimed at innocent people out in the open." Join hundreds of classrooms, campuses, and communities across the U.S. Show the film and host a dialogue. Our lesson plans and materials will equip you to combat hate with Revolutionary Love. 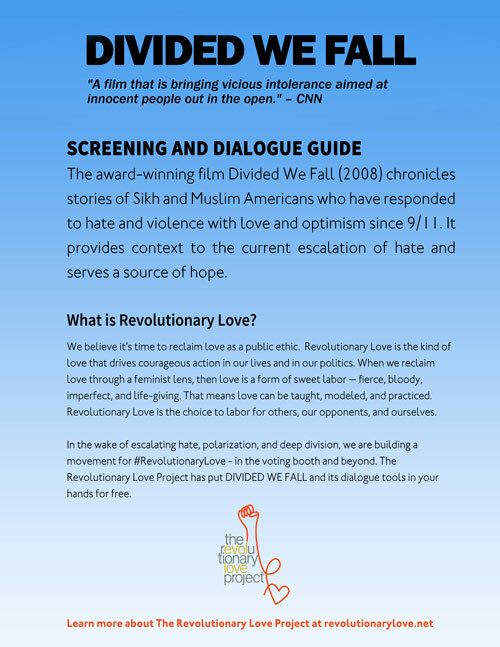 The award-winning film Divided We Fall chronicles stories of Sikh and Muslim Americans who have responded to hate and violence with love and optimism since 9/11. It provides context to the current escalation of hate and serves a source of hope. Our Screening and Dialogue package contains everything you need to host a screening and meaningful dialogue. You can use it to screen the film and host a conversation in your classroom, house of worship, local public library, community center or even living room. If you are an educator who wants to teach the film in your high school or college classroom, you can find the lesson plans below.